A report released recently by First Nations Development Institute (First Nations) highlights that community foundations often fall short when it comes to philanthropic giving to Native American organizations and causes. 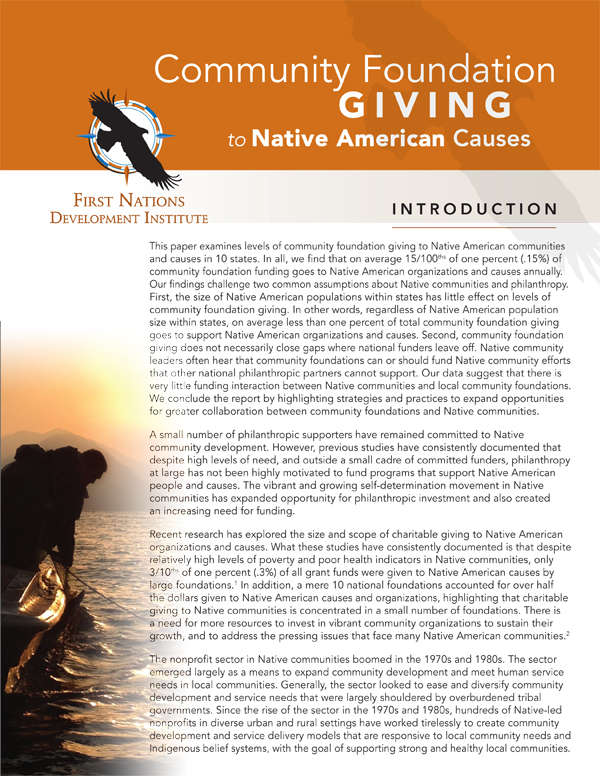 In Community Foundation Giving to Native American Causes, First Nations researchers found that, on average, only 15/100ths of one percent of community foundation funding goes to Native American organizations and causes annually. The report looks at giving by 163 community foundations in 10 states. In all of the states studied except Alaska, which was an outlier, the dollar amount of grants given to Native American organizations and causes was much lower than might be expected given Native American population size and levels of need. This research project was supported by Fund for Shared Insight, a national funder collaborative working to improve philanthropy by advancing the practice of feedback loops and elevating the voices of those least heard.